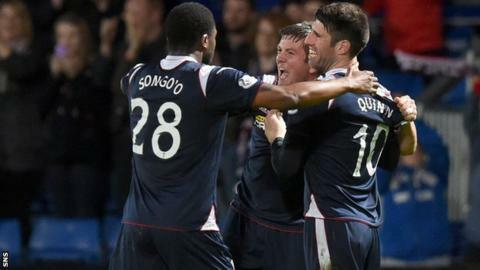 Derek Adams hailed Ross County's achievement of securing a third successive season in Scotland's top flight after the win over Hibernian. The victory, secured by Richard Brittain's second-half penalty, means County cannot finish in the relegation play-off spot. "To do this again, it's hard work," Adams told BBC Scotland. "It's testimony to everybody that's been with me. I'm just delighted for everybody associated with the club." County finished in the top six last season after winning promotion the season before. And though they struggled in the first half of the current campaign, improvements since the New Year gradually garnered enough points for safety. "This means a lot to the players, the football club and the supporters," added Adams. "It's a great night - the second season that we've been able to stay in this Premiership and it's been magnificent. "It's a small football club. We're a wee village team and we've got a population of 5,500. "People at this club have tried before to get to the Premiership, people have tried many times with more money than I've ever had and they haven't been able to do it. "We've been able to stay in this Premiership with limited resources. "Over a season, you stay in the league because of a season's work, not a night's work. This football club has moved on and I'm delighted for it because we've come a long way in a short space of time. "All that mattered [against Hibs] was the victory. At this stage in the season, it was about grit and determination. We got the goal, we got the penalty and I thought our players were resolute in the end. "They stuck to their task. We could've scored more. Hibs pushed us back in the end."